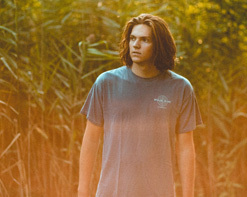 Jack Shields is a singer, songwriter, guitarist and producer from the forested corner of Connecticut. His sound is best described in his own terms as “blending and bending the genres of rock, hip hop, and folk.” His newly released music video for “Leaving California” gives a close look into the artist’s narrative, telling the story of who Jack Shields really is like never before. Shields has a fierce work ethic that takes him to new highs with each release- and believe me, there have been many. Upon delving into the artist’s portfolio, one will find that his Soundcloud has been updated with new music for the past two years. These uploads consist of homemade gold: songs and sounds of various genres, displaying Shields’ ever-lasting intrigue when it comes to the art of creating music. With so much experience making, recording, and releasing music, it’s no wonder his Leaving California EP presents itself as such a well thought-out, mature release. We are super excited to link up with Jack Shields to bring you the “Leaving California” video. We’d love to get you involved with everything Jack Shields, so don’t hesitate to let us know what we can do on our end to make that happen. Please contact Andy Gesner and the HIP Video Promo team at (732)-613-1779, email us at info@HIPVideoPromo.com or visit www.Facebook.com/JackShieldsMusic for more info on Jack Shields.